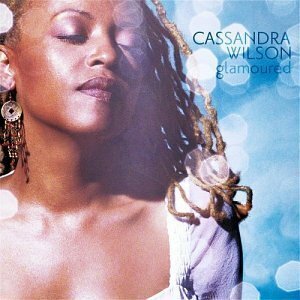 Cassandra Wilson’s refurbishing of blues, country, R&B and contemporary pop tunes has served her well over the past decade, catapulting her from the margins as an eccentric singer to a mainstream icon. Her influence touches artists as disparate as India.Arie, Norah Jones and Jhelisa Anderson, but at the same time Wilson’s eclectic mojo threatens to become predictable. Glamoured pretty much offers her signature rootsy, stripped-down percussion-strings aesthetic, subtly offering new sonic colors, thanks to Gregoire Maret’s harmonica. It does however fair better than her last two previous albums, Belly of the Sun and Traveling Miles, in that Wilson’s found a new producer in guitarist Fabrizio Sotti, and she reunites with guitarist and former music director Brandon Ross on a few cuts. There’s also a reunion of sorts with drummer Terri Lyne Carrington, who played on Wilson’s mid-’80s classic Blue Skies and participated in the early M-Base scene. Songs like the refreshingly uptempo “I Want More” and the funky “What Is It” help break the lull of her often-languid musing. Wilson’s sensuous contra-alto still remains a force to be reckoned with. On songs like her self-penned “Heaven Knows” and “Broken Drum,” her caressing voice can be so bewitching that sometimes the lyrics become secondary. That can be problematic, especially considering how carefully she chooses her material. Glamoured demands undivided attention on headphones; if you listen to it on a sub-par audio system, you might not even recognize that this is Wilson’s most personal-sounding album yet as she examines the institute of marriage through bittersweet lenses. So, don’t let the familiar comforts of Wilson’s sound fool you. Underneath all of Glamoured’s calmness lies a storm of personal revelations. Van Morrison: What’s Wrong With This Picture?